Eyes focused on a successful title defence, Japan’s Jun Mizutani duly reserved his place in the quarter-finals of the Men’s Singles event at the Seamaster 2017 ITTF World Tour Platinum Australia Open in Gold Coast, by emerging successful in his second round encounter on Wednesday 5th July. He overcame colleague Maharu Yoshima, the no.12 seed, in six games (5-11, 11-3, 7-11, 11-6, 11-7, 11-8). A fine effort from Jun Mizutani but he was somewhat upstaged by colleagues, Masaki Yoshida and Yuya Oshima, as well as to some extent by Kenta Matsudaira. Required to compete in the qualification tournament, Masaka Yoshida accounted for Sweden’s Mattias Karlsson, the no.9 seed (11-9, 11-9, 5-11, 11-9, 8-11, 14-12), to be followed by Yuya Oshima, the no.10 seed, who caused an even bigger shock. He beat Portugal’s Marcos Freitas, the no.5 seed (11-7, 12-10, 11-8, 11-5). Wins contrary to expectations, the win recorded by Kenta Matsudaira, the no.7 seed was as status expected but he was stretched to the very limit by one of the year’s most improved players. He beat Korea’s Lim Jonghoon by the very narrowest of seven games margins (13-11, 8-11, 3-11, 6-11, 11-7, 11-6, 13-11). Defeat for Korea but there was success. In the contest of the qualifiers, Cho Seungmin beat Sanil Shetty (11-9, 11-3, 11-6, 11-7) on a day that did not witness the best of fortunes for India. A brave display by Sathiyan Gnanasekaran but in a full distance seven games duel it was defeat; he was beaten by Frenchman, Simon Gauzy, the no.6 seed (11-7, 11-7, 7-11, 7-11, 11-7, 8-11, 11-8). Success for France but as the day closed there was defeat. Both players required to qualify, Tristan Flore was beaten by England’s Paul Drinkhall (11-9, 6-11, 6-11, 13-11, 11-8, 11-8). 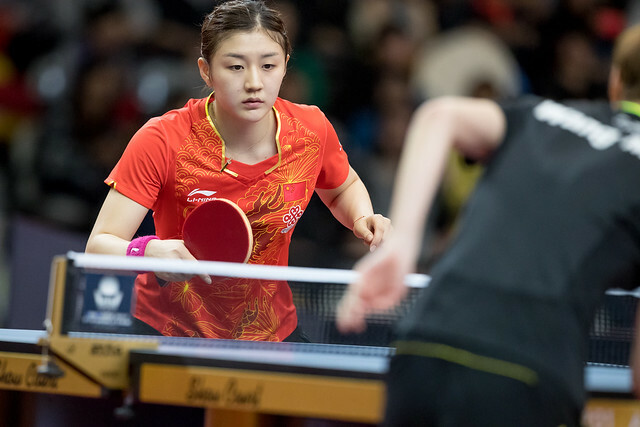 Meanwhile, in the second round of the Women’s Singles event, China ruled supreme; six Chinese players entered the arena, four not seeded, six emerged successful. Zhu Yuling, the top seed and Chen Meng, the no.3 seed both accounted for Japanese adversaries as did Zhang Qiang and Gu Yuting. Zhu Yuling beat Miyu Kato, the no.13 seed (11-9, 11-9, 12-10, 11-2), whilst Chen Meng accounted for Hina Hayata, the no.10 seed (11-7, 11-6, 11-7, 11-8) and Gu Yuting ended the hopes of Honoka Harimoto (11-8, 11-9, 10-12, 10-12, 11-8, 12-10). Not to be outdone, Zhang Qiang overcame Miyu Maeda (9-11, 11-5, 12-10, 11-8, 11-4). Impressive performances, it was the same from Chen Xingtong and Wang Manyu. Chen Xingtong beat Singapore’s Yu Mengyu, the no.14 seed (11-6, 11-4, 11-4, 11-7); Wang Manyu accounted for Korea’s Lee Eunhye (8-11, 11-9, 11-9, 11-8, 11-7). Six quarter-final places for China; the remaining two finished in the hands of Japan. Maki Shiomi beat fellow qualifier, Korea’s Choi Hyojoo (11-6, 10-12, 11-9, 12-10, 11-8); Saki Shibata, likewise a qualifier, upset the order of merit, she ended the hopes of colleague Yui Hamamato, the no.15 seed (11-8, 11-4, 11-3, 11-5). The end result in the Women’s Singles event after the second round; the only seeded players to reach the quarter-finals are Zhu Yuling and Chen Meng. Likewise in the Women’s Doubles event, China dominated. At the semi-final stage Chen Meng and Zhu Yuling, the top seeds, beat India’s Sutirtha Mukherjee and Pooja Sahasrabudhe (11-4, 11-6, 11-2) to reserve their place in the final, where they meet colleagues Chen Xingtong and Wang Manyu, the penultimate round victors in opposition to Japan’s Hina Hayata and Mima Ito, the no.2 seeds (9-11, 11-5, 11-3, 11-7). A place in the final for the top seeds in the Women’s Doubles event, it is the same in the Men’s Doubles. At the semi-final stage, Korea’s Jang Woojin and Park Ganghyeon, the top seeds, accounted for Japan’s Jin Ueda and Maharu Yoshimura, the no.3 seeds and the winners at the recent Seamaster 2017 ITTF World Tour Platinum China Open (11-9, 11-5, 11-8). They now meet Chinese Taipei’s Chen Chien-An and Chiang Hung-Chieh, the no.2 seeds, who in the penultimate round accounted for Singapore’s Gao Ning and Pang Xyu Jie, the no.4 seeds (12-14, 11-7, 8-11, 11-4, 11-7). The quarter-finals and semi-finals of both the Men’s Singles and Women’s Singles events will be played on Thursday 6th July; the final of the Men’s Doubles and Women’s Doubles competitions on Friday 7th July.